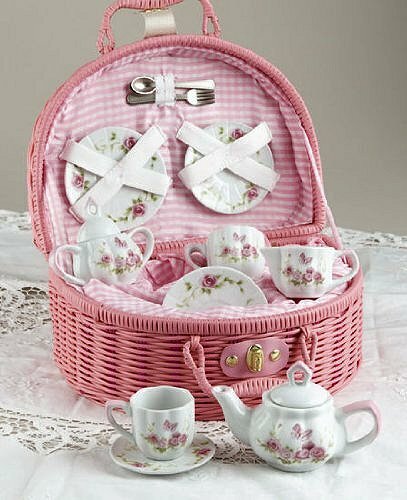 Pink Chic Rose Tea Set - In lovely Carry Basket - Any little girl will be tickled pink to get this teaset. Delicate little pink flower 'grace' this tea set. Tea set comes with a teapot, sugar and creamer, 2 cups and saucers, 2 plates, 2 forks and 2 spoons. Child's tea set comes in a pink wicker basket lined with pink and white check fabric. Teapots hold 4oz and teacups 1 1/2oz.